The above info came from atomofish, and was edited by yours truly (contact me). The image came from VCDDVD88.com. Before Escaflowne, there was a little known anime series from Yoshiyuki Tomino (Mobile Suit Gundam) that also mixed fantasy with giant robot action. 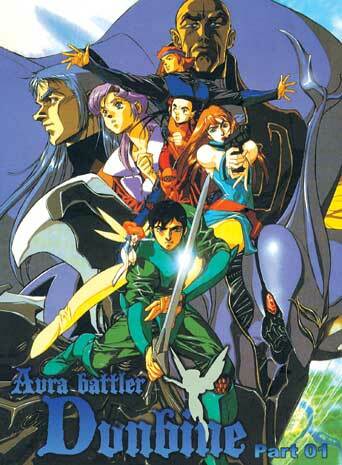 Aura Battler Dunbine tells the story of the far off world of Byston Well. The main character is Sho Zama, a person from Tokyo who accidently travels to Byston Well after a motorcycle accident. Byston Well is a mystical world filled with Knights, Dragons, and Castles. They also have giant, powerful robots known as Aura Battlers (which has technology that originates from Earth). Sho discovers he has a special "aura" which enables him to pilot an Aura Battler. He's drafted into a war where he becomes a pilot of a special Aura Battler named Dunbine. However, he discovers the sinister motives of his superiors (lead by Drake Luft) and switches sides to a resistance force created to save Byston Well from Luft's forces.